Sinclair Pharmacy has been a part of the Stratford community since 1960. We have continued to provide personal service and health care advise throughout your life and meeting your changing needs. Ask your Sinclair Pharmacists about any of the great services we offer. Since March 1960, Sinclair Pharmacy has offered free delivery of your prescriptions right to your home. When John Sinclair first opened the pharmacy the deliveries were made on bicycles. Our delivery method has changed but the same friendly service remains. When you are not able to pick up your prescriptions, simply contact us to arrange delivery to your door. While you are at it, ask to add some other items like skin care, vitamins or your favourite box of Rheo Thompson Candies. Contact us for more details. All infusion sets with needles attached, lancets, needle tips, needles, pens, pen needles, prefilled cartridges, prefilled syringes, are part of the Ontario Sharps Return Program, a program promoting the safe and easy disposal of “sharps”. The purpose is to ensure that “sharps” that are either used or no longer needed are NOT disposed of in the garbage. Ask us for an approved Sharps Container to take home and place used blood-testing materials inside. Only sharps in approved containers that are labeled with the universal bio-hazard symbol are acceptable. Once it’s filled bring it back to Sinclair Pharmacy and we will dispose of it safely. Talk to us about how you can be a part of this program. We are here to help you manage your prescriptions. Whether it’s questions about taking your medication, renewing and refilling or transferring your prescriptions, we will make it easy. Learn More. Schedule an appointment with a Sinclair Pharmacist to review your medications. Learn More. Our pharmacy team is ready to help you choose the right product and provide the training you need to work with your diabetes or ostomy management. A simple and convenient way to help you to remember to take the right medications, vitamins and supplements at the right time. We do all the work to make managing your health easier. Learn More. 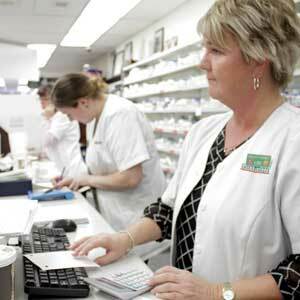 Let us help you manage your medications and ensure that you have safe, effective and up-to-date products. Learn More.